PoPville » March Madness at City Tap House Plus Other Spots to Watch Games Thurs./Friday? March Madness at City Tap House Plus Other Spots to Watch Games Thurs./Friday? WHAT: Calling all college hoops diehards, craft beer fans & bracket busters! The newly opened City Tap House, located at 901 9th Street, NW, just steps from the Verizon Center, is pleased to host a special bracket party on Wednesday, March 19th at 5 PM. City Tap House will be featuring two special casks of Sly Fox Brewing Company’s Odyssey Imperial IPA and Route 113 IPA. 10-ounce pours will be priced from $6 to $7 each. Guests are encouraged to stay the evening because the individuals who kick each keg will receive a Sly Fox Brewing Company swag bag. Additionally, bracket busters have until 12 Midnight to hand in their brackets and become eligible to win two prize packs. The individual with the winning bracket at the end of the tournament will receive an overnight stay for two in Philadelphia along with a $250 gift card to City Tap House Philadelphia, a 40-inch flatscreen HDTV, and a tour of Sly Fox Brewery Company with Head Brewer Brian O’Reilly. The runner up will receive a $100 gift card to City Tap House DC. “It’s almost ‘bracket’ time for college basketball fans and Washington-area restaurants are offering up the next best thing to sitting courtside with March Madness-inspired happy hours and game viewings. Georgetown’s new Pinstripes will host March Madness specials for spirited fans on game days including $3-$5 drink specials, and offer up to $500 for winners of their bracket contest. Beer lovers can watch the game over flights of large-format brews at Clifton, VA’s Trummer’s on Main, and basketball enthusiasts can enjoy half-off bites and $5 pints & punch at Jack Rose Dining Saloon’s “Courtside Happy Hours” on its lively heated rooftop deck. Almost as good as sitting courtside, Jack Rose Dining Saloon will host a “Courtside Happy Hour” on the rooftop terrace during March Madness. Starting March 18 and running through the end of the tournament, Jack Rose will air games (during business hours) on the terrace’s three large flat screen TVs, while serving up half-priced bites like Fried Chicken Skins, Smoked Whiskey Wings, Fresh Local Oysters and more. The bar will offer $5 Pints & Punch specials, on select craft brews and house made punch cocktails during the games. 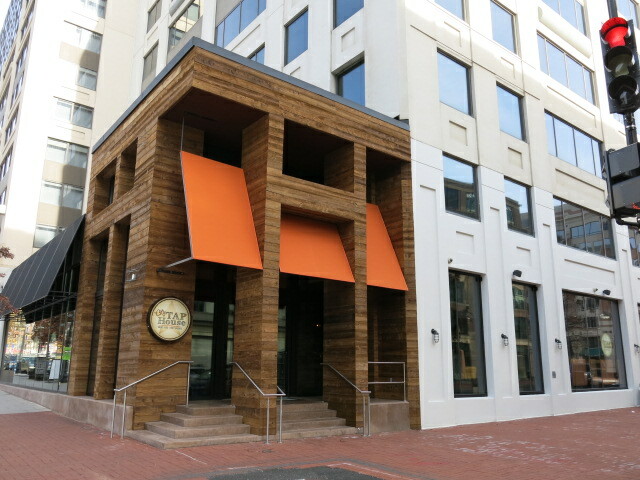 Jack Rose Dining Saloon is located at 2007 18th St. NW in Washington, DC. For more information please visit www.jackrosediningsaloon.com. For college basketball fans that show their team spirit, Pinstripes is the perfect place to watch the March Madness tourney. On any NCAA tournament day, guests who wear their favorite college attire can take advantage of March Madness drink specials including $3 drafts, $4 house wine and $5 premium well drinks. And those who think they’ve picked the winning bracket can submit their bracket to [email protected] by midnight on March 18 for a chance to win gift cards up to $500.